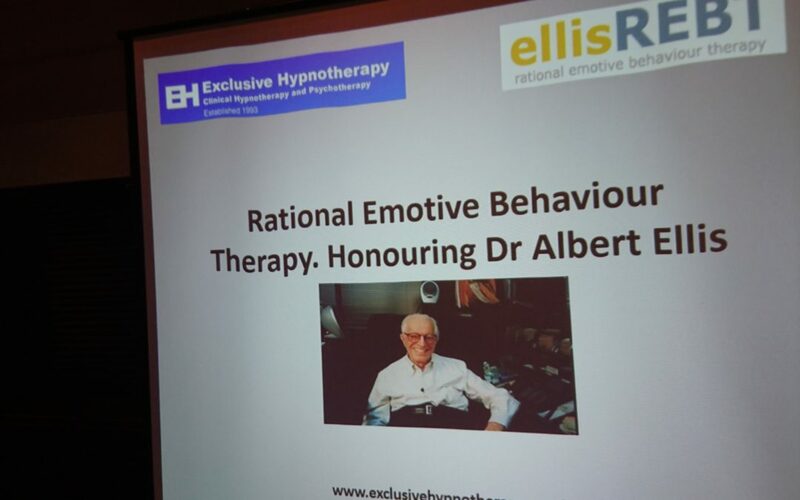 I had the honour of being asked by Dr Joffe Ellis, the wife of the late Dr Albert Ellis and entrustee of his Rational Emotive Behaviour Therapy to present this Workshop in her absence. The venue was the Brighton Hilton Metropole on May the 3rd 2017. My colleague Dr Joffe Ellis was presenting in Boston USA at the same time as the BPS Conference so I gladly agreed to present. As many of you reading this may know, both I and Dr Joffe Ellis are committed to educating, not only our clients but also therapists with REBT the pioneering, ground breaking cognitive approach that laid down the foundations for Cognitive Behaviour Therapy. Almost single handedly, Albert Ellis revolutionised psychology in the mid 1950s. He was reviled by his colleagues for breaking away from ineffective Freudian Psychoanalysis. Ellis, as had Professor Aaron Beck who entitled his approach CBT in 1967, had been a practitioner of Psychoanalysis. Drawing on his formative years and physical problems that he endured and overcame as a child, he created Rational Therapy. 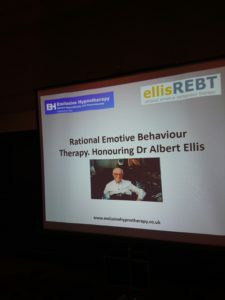 Dr Ellis later called it Rational Emotive Behaviour Therapy to encapsulate the emotional aspect of this most widely trialed, multi-modal and effective psychotherapy. His ground-breaking work changed the course of psychology and psychotherapy, and contributed to changing what we might now call outdated and uncivil attitudes within society in his generation. His writings, presentations and training’s influenced inestimably large numbers of people in the helping professions, clients in psychotherapy, as well as members of the general public who read his books or heard his lectures. The purpose of my presentation was to convey the enormous impact and efficacy of REBT. 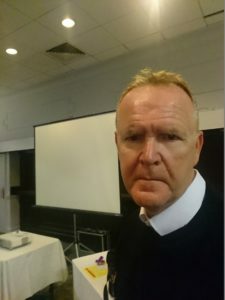 As a Hypno-psychotherapist of almost 25 years in full-time clinical practice and having helped thousands of people I was eager to spread the word. Many of my clients are the most intelligent, caring, conscientious people I have met.Unfortunately, many have a metaphorical PhD in self-criticism (and commonly, a labile nervous system). I have found REBT brilliant at allowing the client to define the situation rather than letting the tail wag the dog! In my early years as a therapist I studied and practiced (like Dr Ellis) psychodynamic approaches. I found them unhelpful, confusing and in fact created more problems to the already fearful, bewildered person. Other approaches of the same era conveyed absurd generalisations and mysticism. Following this brief historical perspective, I explained the three dysfunctional core beliefs with their inaccurate definitions that created psychological disturbances. I demonstrated the ABC form in action. I highlighted the non-self helping belief that people tell themselves about a situation that ultimately creates the symptom. How memory – something that has been dismissed by novice therapists in their quest for the holy grail of enlightenment – and its management and a relevant case history. 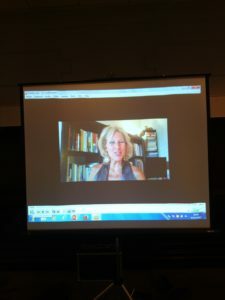 I then presented a video that Dr Joffe Ellis (Adjunct Professor of Psychology, Department of Clinical and Counselling, Psychology Teachers College, Columbia University) had specifically made for the conference. She discussed key moments in Ellis’ life that contributed to the REBT theory; aspects of REBT highlighting visionary assertions given by Ellis which now are being scientifically proven through research in neuropsychology, were; humanistic components of the approach along with unique aspects not emphasised in other cognitive approaches as well as their importance to future application and research. It was an exhilarating experience and many, many people in the audience enjoyed it. My advice for novice therapists is that if you really want help a person get better, enjoy life in the past, present and future and for the long term, teach them REBT; it works!